In it, she shares a recent encounter she had with an old lady who collects cardboard for a living, and how in spite of her cramped living conditions and exhausting cardboard-collecting job, her positivity in life and generosity shines through. She earns around $0.10 for 1kg of cardboards that she collects everyday and barely make more than $1 each day. She speaks fluent cantonese. As she continued, a huge cockroach was also happily running pass me and through the pile of items. Before we left her home to head back to the kopitiam downstairs, i passed her a red packet, she was adamant in refusing it. When I first saw her at the kopitiam, the first thing that she did upon knowing that I haven’t eaten is to offer me the mixed vegetable rice packet that she redeemed through the coupon exchange. “I may be poor but I am happy.” she said cheerfully with the sweetest toothless smile. No. I think you are rich. You have so much treasures of the heart that shines through your life. I am truly touched by your generosity and optimism. I often wonder what does one lives for at that ripe old age with no family members around. Why does one choose to toil until their last breathe? Why does one refuse ‘help’ when provided? What does one truly need? I don’t have all the answers but what I am pretty certain is, a life of Gratitude is a truly beautiful one. Thank you so much Mdm Heng for the much needed reminder. Perhaps, all the elderlies need is just a little more care from society. And for people to listen to their stories. “Always remember there is only two most important things in life. One is good health. Two is a harmonious family.” – Words of wisdom from someone who has lived and toiled for 95 years. 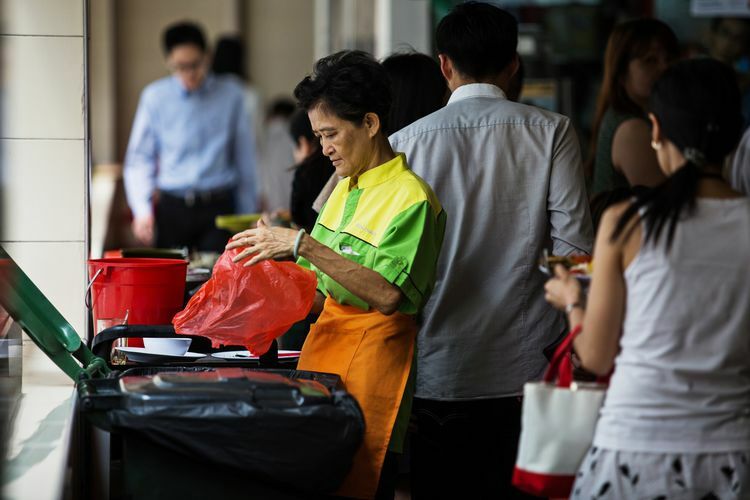 Among the 5.5 million people living in Singapore, an estimated 440,000 are aged 65 and above, and the problems that come with an ageing population are prevalent. In spite of the numbers, the elderly remain largely an ‘invisible’ generation, with many either staying indoors due to a lack of mobility or working low-wage jobs that we often overlook. A recent opinion piece on The New York Times sheds light on the writer’s observation of the similarly ageing workforce around her, usually working in low-paying jobs. After speaking to them on why they’d rather work than enjoy their golden years, most cited not wanting to be a burden, keeping active and wanting to contribute to society as reasons. In our busy lives, we tend to neglect the elderly around us and the lessons they can teach us from their years of experience. 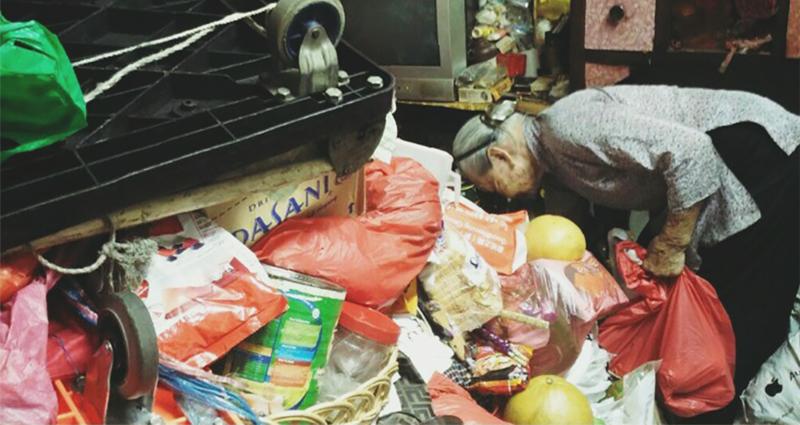 The Facebook post comes as a call for us to look out for not only our elderly parents and relatives, but also those we encounter in our daily lives – from the ones who restock our supermarket shelves, to the ones who lug around our discarded goods to sell for a meager amount. While as individuals, we might not be able to alleviate all of their problems, we can make their days brighter by giving them a warm smile, or even a heartfelt “thank you” when they clear our bowl-ridden tables. Want to play a part in helping our elderly? Check out Facebook pages like Happy People Helping People, Willing Hearts and A Packet Of Rice to see how you can contribute.